Blacula is a blaxploitation film, that rises above its origin. largely because of the quality of the acting, especially the title character, portrayed by William Marshall. Dracula: You shall pay, black prince. I shall place a curse of suffering on you that will doom you to a living hell. I curse you with my name. You shall be… Blacula! Dracula is both vicious and vindictive, and turns the prince into one of his undead … And then imprisons him in a sealed coffin. Adding insult to injury, he also imprisons the prince’s beautiful and beloved wife, Princess Luva, along with him … To slowly die from starvation. Nearly 200 years later, a pair of interior decorators living in Los Angeles, Billy and Bobby, purchase the coffin, and become the ravenous Blacula’s first victims – but not the last. 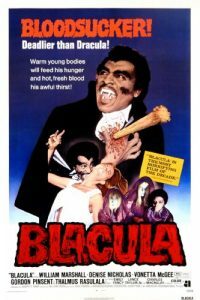 Unlike Dracula, Blacula is a reluctant killer — especially when he meets Tina (Vonetta McGee), seemingly his wife reincarnated. Tina’s boyfriend, Dr. Gordon Thomas (Thalmus Rasulala), however, is a police forensic pathologist, finds something odd about the bodies — and begins to suspect vampirism. I’ll not give away the remainder of the film, except to say that the ending is sad, if not heartbreaking, for the African prince who merely wanted to be reunited with his lost wife.